Except that it isn't really, of course. Not his actual home. He lives in the cage bequeathed to him by the late and much lamented Gary. Gary was our first hamster: a Christmas gift requested by The (Not So) Small One and chosen with care by her loving aunt. As handsome a Ginger as you'd find anywhere. Gary, I mean, not the aunt, who, by coincidence, is also ginger and - you know what? today feels like a ramblin' kind of a day. Let's get back to the point. Meet Craig. Craig is hamster number two. Now, where Gary was quiet, Craig is loud, where Gary was (and there's no gentle way to say this) lazy, Craig never stops. Who would have thought it? hamsters aren't all the same! Craig is a man's man. And that has turned out to be a good thing here, in a house run by women. The only man left has been glad of a bit of male bonding now that The Tall One is out of town. How do you bond with a hamster? Well, it's not, as my Grandma might have said, for want of trying. They spend a lot of time together in the evenings: sometimes in their study, where one works on his computer and one works on breaking through his bars; and sometimes in front of the television, when one carries the other, in his cage, upstairs and sets him in front of Great British Sewing Bee, or whatever else the girls are enjoying. On special occasions Craig chews more frantically even than usual at the latch of his cage and we all agree that he is asking to play in his castle. Ah, the castle. I bought it as a kind of joke Christmas present - you know, when you're looking for extras and you run out of inspiration and end up paying too much money for too few pieces of cardboard? - but, it has turned out to be fun. Putting it together kept everyone occupied for an evening. Or two. And now the entertainment comes from - well. catching Craig. He climbs up and down, then he breaks free, then we catch him, castle him again, it goes on until one side or the other gets fed up. Sometimes Craig tires first and he climbs back into his cage entirely of his own free will. Sometimes girl power wins out and we run downstairs for an apple to bribe them with. And when that happens, then the castle gets tucked behind the sofa til next time. We've had our share of hamsters in this family too. Unfortunately, I don't think I have any pictures---but the stories are pretty good. I love the part of your story where your hubby bonds with Craig! Definitely worth a page! What a fabulous page and story and post! Love it! He sounds like a real gem of a hamster....ours were always nocturnal....and not much fun at all. I had a hamster growing up called Popcorn. Yours sounds like a character, great page too love that top print. I love this post, it really made me smile. It's a great story and a lovely layout. Jo has pretty much said what I was ready to type, word for word! Brilliant story and a well thought out page...love the little sequins dotted about. This did make me smile! Love the layout too. It sounds like Craig brightens up the place with his antics. I imagine he gets more attention when he's playing in the castle than whatever is on the TV. Craig sounds so much more with it than the hamster my sister & I. The only time it was active was at night when he'd run along his squeaky wheel. That is until he escaped one day. I've never seen my mother move so fast as she did that day getting up on a chair. Thanks for the smiles and the memories. What a brilliant page and story! I loved having hamsters when Ben was young, Hammy (not very original) used to go everywhere with us. I remember taking him camping one summer. He lived in the awning under the table. We had a TV with us that year because we wanted to watch the olympics. Un known to each other, Paul and I were feeding him from either side of the table while we watched the games!...he put on rather a lot of weight that holiday. lovely memories. Thanks Sian. Having been the 'parent' of two hamsters in the past, I loved this post. What a fab castle! Our first hamster used to love being pushed around in Action Man's jeep! What a fun post! Loved hearing about Craig's antics. Can't wait to see the layout that comes from putting him on a leash... is that even possible??? Such a happy looking layout! A lovely page Sian, and your hamster does sound a character. Oh it certainly is worth a post and a page. I'm wondering if hamsters are like dogs and take after their owners lol. I don't know what I like best your page or your humorous post!!! I LOVE that bright top paper and the contrasting black title! 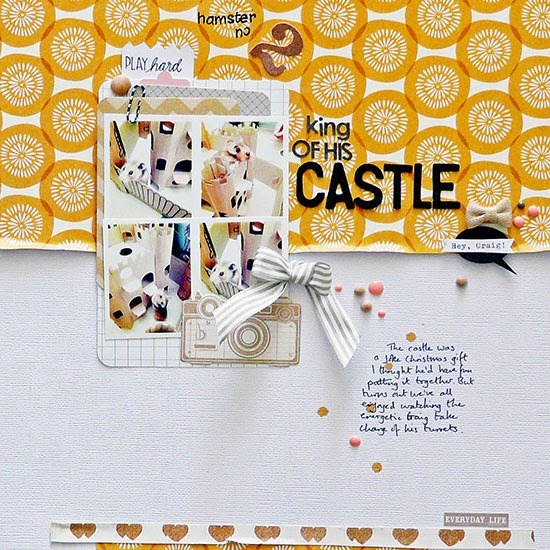 Love the page, love the story, love the castle! We never had a hamster, but we "babysat" gerbils over the summer on several occasions. One night, they got out of their enclosure and were scurrying around under our bed in the middle of the night. Scared the daylights out of me! You ramble all around the facts and weave them into wonderful storytelling. I thoroughly enjoyed the page and the post. It's delightful to hear a good yarn here today Sian ... and to see a page which, as always, is filled with detail and yet, soothing to view. Oh poor Gary! :-) love love love this page and the story! A castle! I had to have a good zoom in on your page! This has been great fun to read, Sian - Gary sounds quite a force to be reckoned with. If you're not careful, it'll soon be Gary on the computer, and The Engineer breaking out from behind the bars :). I admire you design hugely - detail, white space, journalling ... just lovely!